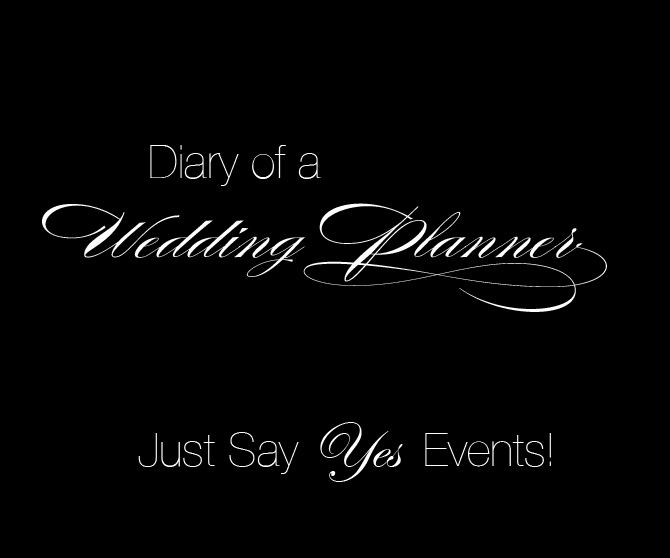 Just Say Yes Events: Event planning for any event!! Many people freak out when it comes to Thanksgiving or the holiday season..... Now a days with event planning firms were pretty much able to plan and execute any event. 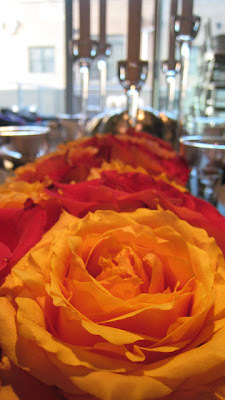 I had the privilege of designing and executing a gorgeous Thanksgiving table for a client here in Chicago. They wanted a traditional table with a modern touch since their home is on the modern side. Here is what we came up with........The client had a wonderful dining room table which we used. 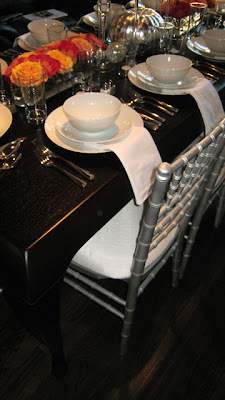 Silver chivari chairs with white dupioni silk cushions were rented. As I mentioned before the client wanted a fairly traditional set up but with a modern touch. We achieved this by keeping it simple. The china was a plain white high gloss china set... flatware basic aswell with a simple scroll detail at the bottom.... and stemware very modern not design. The tea light holders were actually cocktail glasses that were part of the collection that the tall glasses were from. The client like the size of them versus tiny tea light holders. 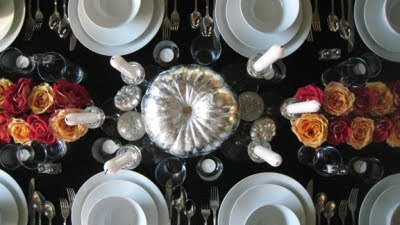 The centerpiece was very important for the client as she was going to be utilizing her buffet for the food instead of placing it on the table.I highly recommend this, after the food has been out for a few minutes its not very attractive and appealing! It much better to do a course dinner instead... soup..salad..etc The centerpiece was composed of gourds, tapers, mosaic iridescent spheres, and roses. The gourds were actually an almost cream color. We needed them to fit in so we painted them white then silver leafed them. It is a messy process but well worth it! 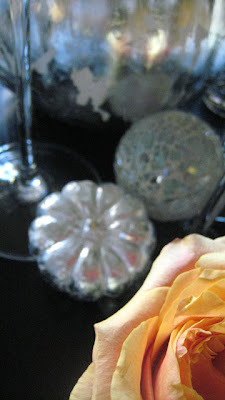 The rose arrangements were low being that this would be a dinner and people should be able to see one another! This is where we added our pop of color. Red, orange, yellow, and pink were al in these roses...they resembled what fall leaves look like. White taper candles in tall candle holders and this completed the look. It was absolutely stunning! I was actually walking out as her guest arrived and it was wonderful to see the reactions on their faces..... the OOOOHHHH AND AAAAAAAAHHHHHH...... Is what I work so hard to achieve.... I want them to remember it for many years to come. So instead of freaking out during the holidays...... hire a professional.... Its what we are here for! This looks great! The table looks absolutely gorgeous! I love the traditional, yet modern look! Check out www.pmproductions.com. I really like their stuff too.